The robotic Japanese cargo vessel now en route to the International Space Station is loaded with food, clothes, equipment — and a set of tiny amateur radio satellites, including one that will write Morse code messages in the sky. 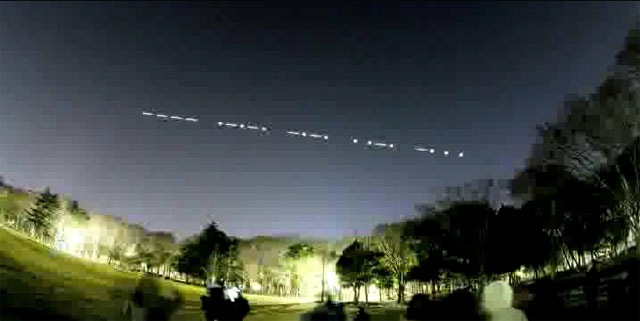 […]One of the [satellites], FITSAT-1, will write messages in the night sky with Morse code, helping researchers test out optical communication techniques for satellites, researchers said. […]One of FITSAT-1’s experimental duties is to twinkle as an artificial star, said project leader Takushi Tanaka, an FIT professor of computer science and engineering. Tanaka’s research interests include artificial intelligence, language processing, logic programming and robot soccer, in addition to cubesats. Tipping the scales at just under 3 pounds (1.33 kilograms), FITSAT-1 carries high power light-emitting diodes (LEDs) that will produce extremely bright flashes. “These, we hope, will be observable by the unaided eye or with small binoculars,” Tanaka says on a FITSAT-1 website. After its deployment from the orbiting lab, the cubesat’s high-output LEDs will blink in flash mode, generating a Morse code beacon signal. Read the full article on Space.com. This entry was posted in CW, Events, Satellites and tagged Cubesat, CW, FITSAT-1, Morse Code, Space Station. Bookmark the permalink. That would be neat to see (and hopefully photograph)! I hope it’s visible, at least to those lucky enough to live under dark skies.